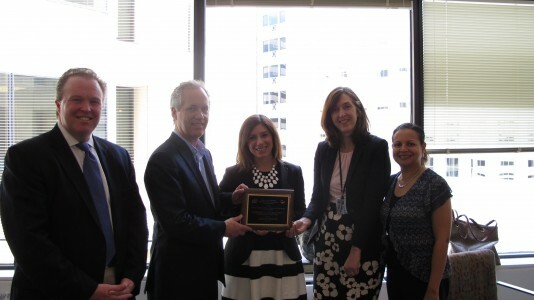 ASPA welcomed Louisville Mayor Greg Fischer on Wednesday, June 24, to accept an award for his city’s outstanding work in performance management. Louisville received the Center for Accountability and Performance (CAP) Organizational Leadership Award. The Organizational Leadership Award recognizes outstanding application of a systems approach to performance measurement. The use within the organization has resulted in a culture change, sustained improvements and demonstrated positive effects on government performance and accountability. Louisville, under the leadership of Mayor Fischer, has transformed the delivery of municipal services, maximized efficiencies and spurred innovation. In selecting the LouieStat program, CAP noted that the mayor effectively merged and transferred his private sector experience with leading practices in government management to create a multidisciplinary, systems approach to performance management. “Building off traditional performance stat principals, Louisville modernizes the approach integrating process-oriented reviews, lean methodologies and a host of other best management practices,” the award letter said. In addition to putting together a team of performance experts, the City of Louisville has forged key relationships with anchor institutions in the city, including philanthropic organizations and private sector partners. The results have included a thriving downtown area, major process improvements that have yielded significant savings, a focus on improving public safety, a sustainable approach to growth and many more positive areas of impact to the city. Solve nagging, systemic budget issues. Take job creation to the next level. Invest in our people and neighborhoods fostering an excellent quality of place. Create a plan for a vibrant future. In order to ensure that the city is on track, LouisStat convenes regular meetings with 18 of the city’s departments and focus on the role each agency plays in executing the city’s mission. Each agency has a robust set of key performance indicators that tie to goals. The goals are often owned by multiple agencies. The city’s departments engage in group problem-solving by using the LouisStat platform to host data-driven discussions about how to best meet shared goals. Congratulations Louisville! First visit ever on the Community Integration Project of Syracuse University for the federal government way back in 1985 was to Louisville, Kentucky (including foster care often called family care) with their then agency director of Seven Counties Services – Jeffrey Strully, now of California.